Review of: Play House of Doom Slot Free by Play'n Go at Slotorama! Build up the courage to enter the House of Doom and you could also build up your bankroll! This exciting new 10-line slot from Play'n Go has a hard rocking soundtrack to accompany some truly horrifying symbols on the reels. Turn the volume up and as the game belts out omens of chaos, rage, pain and destruction on every head-banging spin. Build up the courage to enter the House of Doom and you could also build up your bankroll! This exciting new 10-line slot from Play’n Go has a hard rocking soundtrack to accompany some truly horrifying symbols on the reels. Turn the volume up and as the game belts out omens of chaos, rage, pain and destruction on every head-banging spin. Horned beasts and other occult symbols emerge from the deafening darkness and align to empower you along the game’s 10 lines. The Seer may materialize to grant more prize-winning combinations. If she happens to appear on the one reel randomly selected on each spin, she expands to cover that entire reel to foretell even more prize money and mayhem. 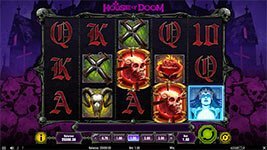 When three House of Doom symbols appear on screen, you win a sequence of 10 free spins, on which the Seer can appear and expand to cover two or more of the game’s five reels. House of Doom symbols also go wild on free spins, and when three or more appear, you win one additional free spin per symbol. Descend into the Skulls of Abyss bonus round to feel the heat whenever three Suffering Skull symbols surface on any normal spin. Harvest valuable skulls to add to your bonus prize until doomsday arrives. House of Doom is programmed to receive; just bang on the door with your head to enter and pray we let you leave. Seer Wilds – The glowing seer is the game’s normal wild symbol and substitutes for all symbols except the scatter to complete wins. Hellgate Feature – one reel is randomly selected and highlighted on each spin. Any wilds on a highlighted reel will expand, replacing all other symbols on the reel. During Doom Spins, between two and rive reels are highlighted. Both wild and wild House of Doom scatter symbols expand on highlighted reels. Doom Spins – Three House of Doom symbols on the reels activate the Doom Spins feature where you will be awarded with 10 free spins! Wild House of Doom – During Doom Spins, the House of Doom scatter symbol becomes Wild and substitutes for all other symbols. Three or more Wild House of Doom symbols award the player with one additional free spin per symbol. Skulls of Abyss – Three scatter skull symbols activate the Bonus Game. 15 skulls appear on screen and you select them to reveal hidden prizes. Win cash prizes or the Doom Spins feature! Cash prizes are added to the total win amount.